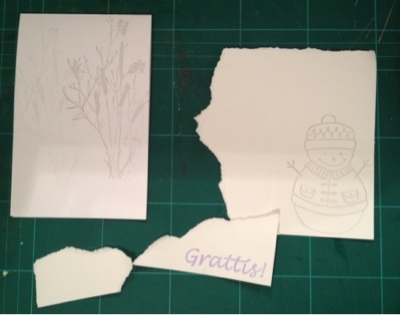 First I stamped the bush from Tim Holtz in gray twice on white card, and the snowman from Hero Arts Share the Joy on a separate one. Also teared a couple of scraps for the front message. 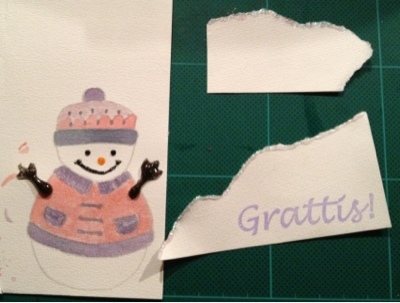 Finally I stamped the greeting on the biggest scrap. Then I added chrystal stickles on the scrap edges, and painted the snowman with distress inks, and decorated with stickles as well (orange peel, black diamond and walnut stain). I chose the colors accordingly to this months color challenge at Hero Arts. After the stickles had dried, I glued the smallest scrap at the bottom left corner, and then the snowman with 3D foam, and finally the one with the sentiment at the bottom right corner. 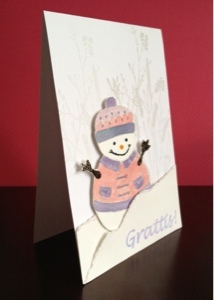 And here is the finished card for 4 year old Matteo.